We have studied an original MMM double buckle bonnet strap and have incorporated our own improvements to produce a first-class period style bonnet strap for MMM cars. These are made locally by a family friend who is a highly skilled leather craftsman and we can offer standard bonnet straps in brown or black. The difference with our bonnet straps are that these are double stitched which means that each stitch is independent to the next and will not unravel, unlike machined single stitched straps. 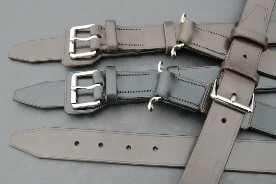 Other features include the 3 strap sections, tongues and leather loops all being border scored and all edges have been shellac coated and bone polished. Lastly, we have incorporated tapered ends to the strap anchoring points whereby the chrome plated staples are stitched into the belt ends.